The original OSCar comes from Autodafe’s collection of analogue synths. 35 Soundsets have been sampled from the original presets in the OSCar memory. There are 91 total patches in the Kontakt Instrument. The aim is not to 100% replicate the OSCar but to capture its sounds, its controls and its characteristics adding unique features that are only possible in the digital world. 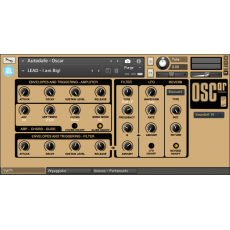 Autodafe OSCar also features a Chord Mode, Glide, Mono Mode and Unison section. The original OSCar had the option to play “Duo” (duophonic) and had glide controls, with different types and times. The ugly (but lovely), knob-stuffed and cluttered interface of the original OSCar has also been reproduced.